Most viral infections occur in extralymphoid tissues, yet the mechanisms that regulate lymphocytes in these environments are poorly understood. One feature common to many extralymphoid environments is an abundance of extracellular matrix. We have studied the expression of two members of the β1 integrin family of collagen-binding receptors, α1β1 and α2β1 (CD49a, VLA-1 and CD49b, VLA-2, respectively), on CD4 and CD8 T cells during the response to influenza infection in the lung. Flow cytometry showed that whereas T cells infiltrating the lung and airways can express both CD49a and CD49b, CD49a expression was most strongly associated with the CD8+ subset. Conversely, though fewer CD4+ T cells expressed CD49a, most CD4+ cells in the lung tissue or airways expressed CD49b. This reciprocal pattern suggested that CD4 and CD8 T cells might localize differently within the lung tissue and this was supported by immunofluorescent analysis. CD8+ cells tended to localize in close proximity to the collagen IV-rich basement membranes of either the airways or blood vessels, whereas CD4+ cells tended to localize in the collagen I-rich interstitial spaces, with few in the airways. These observations suggest that CD4 T cell interaction with the tissue microenvironment is distinct from CD8 T cells and support the concept that CD4+ T cells in peripheral tissues are regulated differently than the CD8 subset. The interstitial environment and basement membranes through which lymphocytes must migrate are rich in extracellular matrix (ECM)4 molecules. The most abundant of these are the collagens which, in the lung for example, account for 15% of its dry weight (1, 2). The major cell surface receptors for collagen expressed by T cells are the integrins α1β1 (VLA-1) and α2β1 (VLA-2). VLA-1 preferentially binds to types I and IV collagen, whereas VLA-2 preferentially binds to type I collagen (3, 4, 5). Type I collagen is the most abundant collagen type, comprising 90% of the total body collagen, and is found in bone, skin, connective tissues, and internal organs (6). Type IV collagen is the major component of basement membranes and its distribution is restricted to this location (6). VLA-1 and VLA-2 have also been shown to be receptors for a variety of other less abundant ECM components including laminin (7). Respiratory infection with influenza virus is a major cause of illness and death in humans (8, 9, 10). Understanding the essential elements of immune protection from this virus is of obvious importance. Influenza virus is also unique among viruses in its ability to experience antigenic shift as well as antigenic drift (11, 12, 13). These changes produce new flu strains that avoid existing neutralizing Abs, thereby easily establishing infection. Fortunately, many individuals have heterosubtype-specific CD4+ and CD8+ T cells that recognize conserved internal epitopes common to different serotypes (14, 15). Thus, whereas these individuals may become reinfected with flu, the severity of disease and duration of infection is reduced when heterosubtypic immunity is present (14, 15). Localization of memory CD4+ and CD8+ T cells to extralymphoid tissues is now understood to be an important attribute of immune protection (16, 17, 18). Heterosubtypic immune protection mediated by CD8+ T cells against respiratory infections has been shown to depend on the number of virus-specific cells in the airways (14, 17, 18). We have shown that VLA-1 plays an important role in regulating the ability to retain influenza-specific CD8 T cells to the lung tissue and airways (18). In fact, inhibition or deletion of CD49a, the α1 chain of VLA-1, reduced the number of flu-specific memory CD8 T cells in the lung and abrogated secondary immune protection (18). Whether VLA-1 plays a similar role on CD4 T cells is not known. VLA-2, in contrast, has been shown to participate in the regulation of cell migration within collagen matrices (19, 20, 21). However, its role on T cells is less well-described. Understanding the patterns of VLA-1 and VLA-2 expression by extralymphoid T cells during the course of an immune response would enhance our understanding of how these integrins might function to regulate the antiviral immune response and the formation of tissue memory. Therefore, we have examined the overall patterns of VLA-1 and VLA-2 expression on Ag-specific and total CD4 and CD8 T cells responding to influenza infection in the lung. In addition, immunofluorescence was used to determine the distribution of collagen in the lung and the localization of CD4 and CD8 T cells relative to the matrix environment. Female C57BL/6 (B6) mice were purchased from Taconic Farms at 6 wk of age. Congenic Thy1.1+B6.PL and Thy1.2+OT-II CD4+ TCR-transgenic mice (22) were obtained from colonies maintained at the University of Rochester. All animals were housed in the University of Rochester vivarium facilities under specific pathogen-free conditions using microisolator technology. Primary inoculation with influenza virus was performed in animals 8–12 wk of age. All experimental protocols have been reviewed and approved by the Institutional Animal Care and Use Committee and the animal facility is Association for Assessment and Accreditation of Laboratory Animal Care accredited. The H3N2 A/Hong Kong/X31 (X31) influenza virus was grown and titered in embryonated chicken eggs and harvested as allantoic fluid preparations (23). The WSN-OVAII influenza virus was used as described (24). For primary infections, mice were sedated with avertin (2,2,2-tribromoethanol) before intranasal challenge with 105 EID50 of X31 or 500 PFU WSN-OVAII in 30 μl of PBS. Thy1.1+B6.PL mice received an adoptive transfer of 1 × 106 CD4+Thy1.2+ congenic OVA323–339-specific TCR-transgenic spleen cells. One and 8 days later, the mice were given OVA (4 mg) in alum (10 mg) in 0.5 ml of PBS i.p. At 15 days after transfer, the animals were exposed two times for 1 h each with 4 h between exposures to OVA aerosol (5 mg/ml) in an inhalation chamber using a small volume nebulizer. Animals were sampled 5 days later to obtain lymphocytes from airway, lung tissue, and spleen. The function blocking hamster mAb Ha31/8 against α1 (25), and the anti-keyhole limpet hemocyanin Ha 4/8 control mAb were all affinity purified in an azide-free, low endotoxin. For flow cytometry, the Abs were conjugated to Alexa 488 or biotin according to the directions of the manufacturer (Molecular Probes). Following cardiac perfusion of the mice with PBS, the trachea was cannulated and bronchoalveolar lavage cells were collected by lavage with 1 ml of HBSS three times. These were then resuspended in complete MEM and plated in a cell culture-treated petri dish for 45 min at 37°C to remove adherent cells. Animals were then perfused with cold PBS through the left ventricle of the heart, and the lavaged and perfused lung tissue was minced and disrupted using a dounce homogenizer. After passing through a 90-μm nylon mesh, lung tissue lymphocytes were isolated from the homogenate using histopaque-1083 (1083-1; Sigma Diagnostics). Single-cell suspensions were prepared from spleen and lymph nodes by disruption in a dounce homogenizer followed by passage through 90-μm nylon mesh. Splenocytes and PBL were depleted of erythrocytes using a buffered ammonium chloride solution (Gey’s solution). All cell counts were obtained by trypan blue exclusion. Lymphocyte populations were stained as aliquots of 2 × 105 cells with various combinations of mAbs to CD8α (53-6.72 or CT8a), Thy1.1 (OX-7), Thy1.2 (30-H12), CD44 (IM7), and anti-CD62L (MEL-14) conjugated to FITC, PE, biotin, allophycocyanin, or PE-Cy5. The conjugated mAbs were purchased from BD Pharmingen or Caltag Laboratories and are referenced in their current catalogs. Tetrameric complexes of H-2Db/influenza polymerase (PA)224–233 (DbPA), H-2Db/influenza nucleoprotein (NP)366–374 (DbNP), and were prepared by the Trudeau Institute Molecular Biology Core Facility and used as described previously (26, 27). Data were collected using either a BD Biosciences FACSCalibur in four-color mode, or an LSR-II in 11-color mode, and analyzed using FlowJo software (Tree Star). Mice were infected with HK/X31 (30 μl) intranasally. On sequential days following infection, mice were placed under deep anesthesia using avertin. The peritoneal cavity was opened and spleens were removed, washed with PBS, placed in OCT and frozen using a mixture of dry ice and 2-methyl butane (−45°C). The rib cage was opened and a blunted 23-gauge needle was placed in an incision made in the trachea. The canula was tightly fixed in place using suture. Warmed OCT (0.8 ml) was slowly injected using a 1-ml syringe to inflate the lungs. The OCT was held in the inflated lungs by tying the trachea with suture. The lungs were then carefully excised and placed in OCT as described for the spleen. Tissues were stored in a −80°C freezer. Sections (5–10 μm) were cut using a cryostat. For staining, sections were thawed and residual OCT was removed by incubating for 5 min with ∼1 ml of PBS. The sections were fixed in a mixture of methanol-acetone (1:1) for 5 min. Following fixation, sections were left to dry for 15 min. The sections were then rehydrated in a 5-min incubation step with PBS-Tween 20 (0.05%). After this point, all incubation and washing steps were made using PBS-Tween 20. An FcR blocking step was performed using unlabeled anti-CD16/32 (BD Pharmingen; 1:200) for 20 min. The sections were washed twice for 5 min and stained with PE-labeled rat anti-mouse CD8a (Caltag Laboratories; 1:100), allophycocyanin-labeled rat-anti-mouse CD4 (BD Pharmingen; 1:100), and unlabeled goat anti-type IV collagen (Southern Biotechnology Associates; 1:200) for 60 min. Sections were then washed and stained with a secondary donkey anti-goat FITC for 45 min. The sections were then washed and mounted using a cover slip. Fluorescence microscopy was performed using a Nikon Eclipse E600 fluorescence microscope equipped with a 100 W mercury lamp (Chiu Technical) and a SPOT RT Color digital camera (Diagnostic Instruments). Images for CD4 T cells, CD8 T cells, and type IV collagen were obtained as grayscale images, then assigned to blue, red, and green channels, respectively. The intensity histograms for red and blue channels were stretched to cover the entire eight-bit range. Segmentation processing was used to distinguish the individual cells and collagen structures. All algorithms as well as the graphical user interface were developed in MATLAB and MATLAB is required for their use. Image contrast was enhanced using a negative Laplacian filter and noise was reduced using a 7 × 7 median filter applied consecutively five times. Intensity holes in the resulting image were filled. The image was then inverted and a watershed transform applied. The watershed image was converted to binary. Nonuniform background was approximated by multiplying the filtered image by the inverse watershed image, which created a map of all low intensity regions between signal peaks (all other regions became 0). The resulting image was then binned to 1/1600 of its original size with the 10th percentile value of all nonzero values assigned to each bin. If no nonzero values existed for a bin, the bin value became zero and was considered an empty bin. Values for empty bins were determined by interpolation using a soap film partial differential equation. The image was then rescaled back to the original size using a two-dimensional interpolation by cubic spline. This resulted in a strong approximation of any nonuniform background fluorescence. The background was then subtracted from the filtered image and segmented by a user-defined threshold. Final segmentation was achieved by multiplying the segmented image by the binary watershed image. Segments were then uniquely identified with different numbers assigned to each. Segments represented the locations of cells and were used for subsequent measurements. After segmentation, the type IV collagen tissue channel (green) was converted to binary. The tissue segments were fused together to create a binary collagen mask by dilating the segments with two structuring elements (s.e.) first using 5 × 3 s.e., then a 3 × 5 s.e. Locations of infiltrating CD4 (blue) and CD8 (red) T cells relative to type IV collagen tissue (green) were determined using the binary collagen mask. The localization of individual cells was accomplished by determining the area and center of mass for each cellular event. Area equals the number of pixels covered by a cell. Center of mass was determined by measuring the average position of pixels (weighted by each pixel’s respective intensity) within a cell. Net intensity is the summation of all intensity values within a cell minus the local background. Local background equaled the mean intensity of the perimeter pixels of a cell multiplied by the area (in pixels) of the cell. Circularity was determined by evaluating the radial variability of a cell. This was accomplished by measuring the distance from the center of mass of a cell to each of its perimeter pixels. The mean (μ) and SD (ς) of the distance set were found. Circularity equals the mean (μ) minus two SDs (2ς), then that quantity was divided by the mean (μ). Negative values were reassigned to zero and the result multiplied by 100 to represent circularity as a pseudopercentage. Two-color events within two pixels (∼0.7353 μm) of one another (measuring from the center of mass of a cell to the nearest edge of the collagen mask) were considered positive for both colors. The resulting data set representing the location and area of each cell was stored as list mode in flow cytometry standard format data and analyzed using FlowJo cytometry software (Tree Star). The percentages of blue (CD4) or red (CD8) cells within a 0.7353-μm radius of the green (collagen IV) mask were calculated after gating on the red plus green or blue plus green positive events. Before infection, examination of CD4 and CD8 T cells in the lymphoid compartment and lung tissue, not including the airways, revealed few cells expressing either VLA-1 or VLA-2 (Fig. 1⇓). In general, few T cells can be isolated from the airways of mice maintained in clean animal facilities and without prior deliberate infection. However, even among the few T cells that could be obtained from pooling the bronchoalveolar lavage of several mice, there was a proportion (∼27%) of both CD4 and CD8 T cells that expressed CD49a, the α-chain of the VLA-1 receptor (Fig. 1⇓A). Fewer T cells expressed VLA-2, with a small number (∼4–7%) of CD49a−CD49b+ single-positive CD4+ T cells, or CD49a+CD49b+ double-positive CD8+ T cells in the airways (Fig. 1⇓A). Very few CD4 and CD8 T cells in the mediastinal lymph node (MLN) and spleen expressed either integrin, with only ∼2% CD49a+ CD49b− T cells in the MLN, and slightly higher (∼7%) in the spleen. CD49a and CD49b are highly expressed on CD4+ and CD8+ lymphocytes in the lung tissue and airways of mice infected with influenza A/HK/x31. 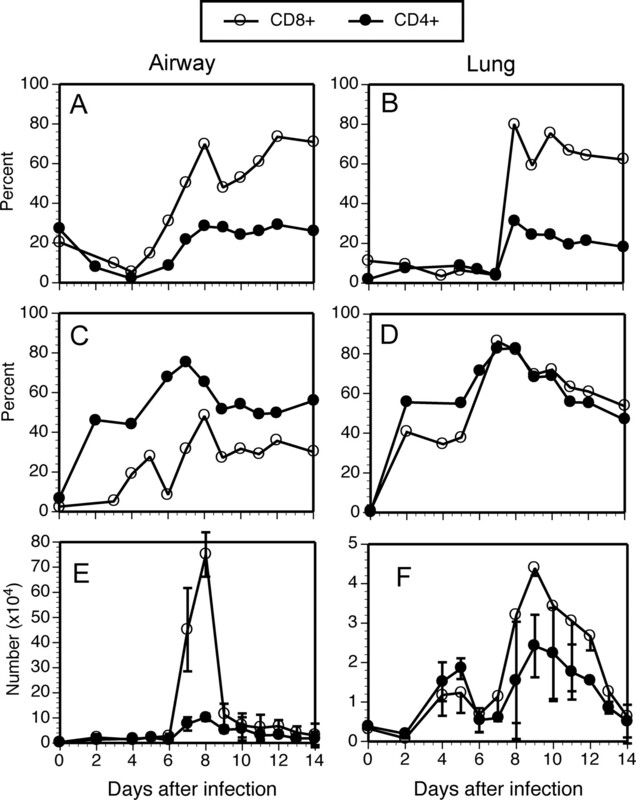 Airway, lung tissue, MLN, and spleen lymphocytes were harvested from B6 female mice before infection (A) or 8 days after intranasal inoculation of influenza A/HK/x31 (B). CD49a and CD49b expression was analyzed on CD4 and CD8 cells subsequent to staining with anti-CD49a (HA31/8)-Alexa 488, anti-CD49b (HA1/29)-PE, anti-CD8-TC, and anti-CD4-allophycocyanin. Figures depict the results of CD49a vs CD49b staining after gating on live lymphocytes and CD4+ or CD8+ cells as indicated. Values in the quadrants indicate the percentage of positive cells in that quadrant. To determine how a virus infection would affect the expression of collagen-binding integrins on the T cells, mice were inoculated with influenza A/HK/X31 intranasally (23). Infection induced increases in the proportions of cells expressing VLA-1 and VLA-2 in all sites sampled, but particularly among the T cells infiltrating the lung tissue and airways. At 8 days after infection, the peak of the cellular response (see Fig. 5⇓E), the majority of CD4 or CD8 T cells in the lung parenchyma expressed either CD49a (31% of CD4+, 80% of CD8+) or CD49b (81% of both CD4+ and CD8+) (Fig. 1⇑B). In the airways, as previously reported (18), CD49a was a prominent feature of the CD8 subset with ∼70% CD49a+. A much smaller proportion (28%) of the CD4+ T cells in the airways also expressed CD49a. Instead, a high proportion (65%) of the CD4 T cells expressed CD49b, with fewer (48%) of the CD8 T cells expressing this molecule. Interestingly, there was a converse relationship between CD49a and CD49b expression between the CD4 and CD8 T cells such that CD4 T cells favored the expression of CD49b only (45%) or CD49b and CD49a (20%), whereas the CD8 T cells in the airways expressed CD49a (33%) alone or in conjunction with CD49b (37%). Few CD4 T cells expressed CD49a alone (8.4%) and few CD8 T cells expressed CD49b alone (11%). These observations suggest that the expression of these integrins could direct the differential localization of CD4 and CD8 T cells within the matrix of the lung environment, dependent on the relative distributions of collagen subtypes. The situation in the MLN and spleen was markedly different from in the extralymphoid lung tissue. Populations of both CD4 and CD8 T cells expressed CD49a and CD49b, and although the proportions of T cells that expressed either integrin were much higher than in the uninfected mice, they were comparatively low vs the lung tissues, particularly for the CD49a+ subsets. This difference from the lung probably reflects the fact the vast majority of the T cells in the lymphoid sites are not virus specific. However, given the relatively low CD49a expression, an additional factor may be that either the signals for up-regulating these integrins are not strong in these sites, and/or that the mechanisms for retaining integrin+ cells there, such as the accessibility of the ligands, are lacking. In light of the low proportions of T cells expressing either CD49a or CD49b in the lymphoid organs, experiments were performed to identify the T cells responding to the infection in an Ag-specific manner. The question being addressed was whether the few collagen-binding integrin+ T cells in the lymphoid sites essentially comprise the subsets of T cells specific for viral Ags. The primary CD8 T cell response to infection with influenza A/HK/X31 is dominated by two viral epitopes within the influenza NP (NP366–374) and the acid PA (PA224–233) (27). In our hands, on day 7 of the infection, CD8 T cells responding to these epitopes represent ∼3.9% and 6.9% of the CD8+ T cells in the airways (Fig. 2⇓, A and B). The patterns of CD49a and CD49b expression on these Ag-specific CD8 subsets in the airways and spleen were compared after gating on the CD8+ NP or PA tetramer+ cells. Among the tetramer+ CD8 T cells, the patterns of CD49a and CD49b expression resembled that of the total CD8 population in the organ from which the cells were obtained. (Figs. 1⇑B and 2⇓, C–F). For example, whereas a large proportion of the CD8 population expressed either CD49a (69%) or CD49b (48%) in the airways on day 8, 46 and 33% of the DbNP+ and 51 and 43% of the DbPA+ CD8+ cells expressed CD49a or CD49b, respectively, on day 7. The increase in values from days 7 to 8 may be attributed to selection within the tissue. In the spleen (Fig. 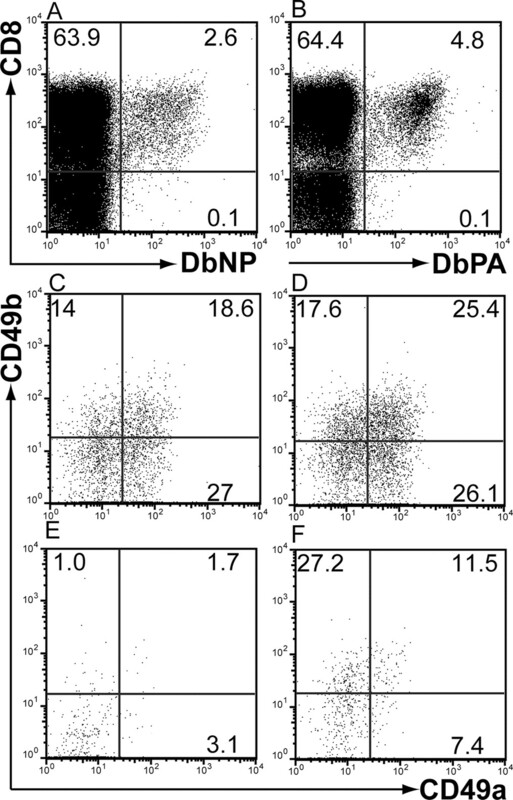 2⇓, E and F), lower proportions of both the DbPA+ and, particularly, DbNP+ cells expressed CD49a or CD49b. From these observations, several conclusions can be drawn. One is that the few integrin-expressing CD8+ T cells in the lymphoid organs do not necessarily represent Ag-specific T cells responding to the infection. Instead, the data are consistent with integrin expression being a reflection of the environment, regardless of whether they have responded to the infection. The pattern of CD49a and CD49b expression on CD8+ T cells in the airways and spleen is independent of Ag specificity. At 7 days after infection with influenza A/HK/X31, airway (A–D) and spleen (E and F) lymphocytes were stained with anti-CD49a (HA31/8)-Alexa 488, anti-CD49b (HA1/29)-PE, anti-CD8-TC, and either DbNP (A, C, and E) or DbPA (B, D, and F) tetramers labeled with allophycocyanin. A and B show, respectively, the NP and PA tetramer vs CD8 staining for airway lymphocytes. C–F, The results of CD49a vs CD49b staining after gating on live CD8+ and tetramer+ double-positive lymphocytes. Values in the quadrants indicate the percent-positive cells in that quadrant. The situation was similar for CD4 T cells responding to influenza infection. CD4 T cells responding to influenza-specific epitopes are difficult to identify by flow cytometry due to the lack of reagents, such as tetramers, to identify the T cells, and compounded by the low frequency of CD4 T cells responding to any single epitope (24, 28). We therefore used our genetically engineered system for stimulating OVA323–339-specific CD4 T cells with influenza virus (24). Thy1.1+B6.PL mice were intranasally infected with influenza A/WSN-OVAII after adoptive transfer of Thy1.2+OT-II TCR-transgenic spleen cells (22, 24). The OVA-specific CD4 T cells could then be identified on the cytometer with Abs to Thy1.2 and CD4. The peak of the cellular response to WSN-OVAII infection occurs at day 9 (24). This infection efficiently recruits donor CD4+Thy1.2+OT-II cells into the airways and lung parenchyma (Fig. 3⇓, A and B), and promotes expansion of the cells in the lymph node and spleen (Fig. 3⇓, C and D). Of these OVA-specific virus-primed cells, substantial proportions expressed CD49b alone, with fewer CD49a+CD49b+ double-positive cells, and very few CD49a single positives (Fig. 3⇓, E–H). CD49a was virtually absent on the donor cells in the MLN and spleen, with small proportions of the cells expressing CD49b alone (Fig. 3⇓, G and H). These patterns were similar to the total CD4 infiltrates observed in X31 infection (Fig. 1⇑). Comparable results were obtained using DO11.10 TCR-transgenic CD4+ T cells transferred into BALB/c recipients infected with WSN-OVAII (data not shown), suggesting the collagen integrin expressing populations do not simply reflect the activation status of the cells, and may be independent of genetic background. Expression of CD49a and CD49b on influenza A/WSN-OVAII-primed OT-II CD4+ T cells 9 days after infection. A total of 1 × 106 CD4+Thy1.2+ OVA323–339-specific TCR-transgenic spleen cells were adoptively transferred into congenic Thy1.1+B6.PL mice. One day later, the mice were inoculated with 500 PFU WSN-OVAII via an intranasal route. At day 9, the peak of the cellular response to WSN-OVAII, lymphocytes were harvested from airway (A and E), lung tissue (B and F), MLN (C and G), and spleen (D and H) and stained with anti-CD49a (HA31/8)-Alexa 488, anti-CD49b (HA1/29)-PE, anti-CD4 (RM4-4)-TriChrome, and anti-Thy1.2-allophycocyanin for analysis by flow cytometry. After gating on the CD4+Thy1.2+ OT-II donor allotype lymphocytes (A–D), cells were analyzed for CD49a vs CD49b expression (E–H). Values in the quadrants indicate the percentage of positive cells in that quadrant. One question that arose was whether the pattern of collagen-specific integrins we observed was something attributable to the virus priming of the cells. To address this question, we primed OVA-specific OT-II CD4 T cells using a strategy typically used as a model of allergic airway disease. Congenic Thy1.1+B6.PL mice received donor Thy1.2+OT-II CD4 T cells 1 day before i.p. injection of OVA in alum. A second dose of OVA in alum was administered 1 wk later. Fourteen days after the first injection, mice were exposed to OVA aerosol for 1 h, then sampled 5 days later for the presence of donor CD4 T cells in the airways, lung, and lymphoid tissues (Fig. 4⇓, A–C). As expected, and contrary to the virus-primed T cells, OT-II CD4 T cells primed in this manner produced IL5 and little IFN-γ (data not shown), consistent with a program of Th2 differentiation (29, 30, 31). Regardless of the organ that was sampled, the pattern of CD49a and CD49b expression was very similar to that of OT-II cells primed by WSN-OVAII influenza virus infection in that many of the lung tissue and airway cells were CD49b+CD49a−, with fewer cells expressing both integrins or CD49a alone compared with CD8+ T cells (Fig. 4⇓, D–F, Table I⇓). In the allergic vs infection models, respectively, there were generally fewer CD4 T cells that were double positive (5 ± 3 vs 17 ± 8% in the airways; 7 ± 3 vs 21 ± 6% in the lung tissue). The low proportion of CD49a+ staining was observed in repeat experiments, and was not due to problems with the Abs because CD8+ cells in the airway and lung tissue of these mice stained very well for CD49a (see insets in Fig. 4⇓, D and E). Though virus infection seemed to favor a higher proportion of CD49a/CD49b double-positive CD4+ T cells, it was still lower than for the CD8+ subset suggesting that the expression of these integrins is intrinsic to the CD4 or CD8 subsets and the organ from which they are obtained, and is only partially affected by the mode of priming. Expression of CD49a and CD49b on Ag-specific CD4+ T cells does not depend on the mode of priming. A total of 1 × 106 CD4+Thy1.2+ OVA323–339-specific TCR-transgenic spleen cells were adoptively transferred into congenic Thy1.1+ B6.PL mice. One and 8 days later, the mice were given OVA (4 mg) in alum (10 mg) in 0.5 ml of PBS i.p. At 15 days after transfer, 14 days after the start of OVA administration, the animals were exposed 2 × 1 h, 4 h apart, to OVA aerosol (5 mg/ml) in an inhalation chamber using a small volume nebulizer. Five days later, lymphocytes were harvested from airway (A and D), lung tissue (B and E), and spleen (C and F) and stained with anti-CD49a (HA31/8)-Alexa 488, anti-CD49b (HA1/29)-PE, anti-CD4 (RM4-4)-TriChrome, and anti-Thy1.2-allophycocyanin for analysis by flow cytometry. After gating on the CD4+Thy1.2+OT-II donor allotype lymphocytes (A–C), they were analyzed for CD49a vs CD49b expression (D–F). Because of the low CD49a staining in this experiment, the insets in D and E show the CD49a and CD49b staining of CD8+ lymphocytes analyzed in the same experiment. Values in the quadrants indicate the percentage of positive cells in that quadrant. The substantial changes in the expression of CD49a and CD49b between the start and the peak of the cellular response led to the question of when these integrins increased their expression. Animals were infected with influenza A/HK/X31 and sampled at several time points for analysis of the integrin expression. What is most noticeable is that, at the start of the infection, very few T cells in the lung and airways are collagen integrin positive (Fig. 5⇓, A–D). The exception is for T cells in the airways, a modest proportion of which express CD49a (Fig. 5⇓A). CD49a and CD49b begin to increase on both CD4 and CD8 T cells in the lung and airway between days 4 and 7. CD49a predominates on the CD8+ subset, peaking briefly at day 8, dropping at day 9, and then slowly increasing again. This trend to peak at 8 days, drop briefly, and recover is a highly reproducible phenomenon, and was noted previously for the NP-specific CD8 population (18). The significance is not clear, though it suggests there may be continual infiltration of CD8 T cells into the lung tissue and airways after day 9, the point at which the virus has been cleared from most or all of the animals (32, 33). A similar trend was not apparent for the CD4+ subset, suggesting independent regulation of these cells in the lung. Kinetics of CD4+ and CD8+ lymphocyte infiltration and CD49a and CD49b expression in the airways and lung tissue after primary infection with influenza A/HK/X31. C57BL/6 female mice were intranasally infected with influenza A/HK/x31. 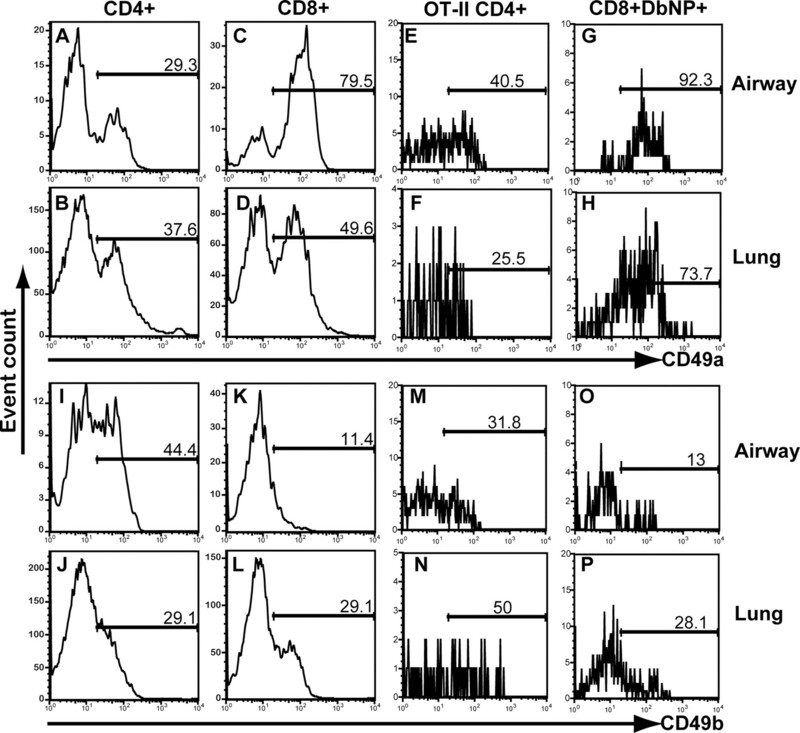 On different days after inoculation, the proportion of CD4+ and CD8+ cells and those expressing CD49a and CD49b were analyzed on cells pooled from the airway (A, C, and E) and lung tissue (B, D, and F) of three to five mice per time point. Integrin staining and analysis of CD49a or CD49b single-positive lymphocytes was performed as described in Fig. 1⇑. The graphs depict the percentage of CD49a+ (A and B) or CD49b+ (C and D) CD4+ (solid symbols) or CD8+ (open symbols) lymphocytes, or the total CD4+ and CD8+ infiltrate in the airways (E) and lung tissue (F). Data in A–D are from a single cohort of mice but are representative of repeat experiments. Data in E and F represent average values for multiple (three to five) repeat experiments and include SDs. As was noted for the peak response, CD49b was a prominent feature of the CD4+ subset, increasing in proportion as early as day 2 in the airways and lung tissue, likely reflecting early non-Ag-specific T cell recruitment. CD49b then peaked between days 7 and 8 and remained at a stable level that was elevated compared with mice that were not influenza infected. Together, the observations suggest that the inflammatory process in the airways and lung may serve to increase the expression of CD49b, or alternatively, to specifically recruit or retain these cells while the infection is active. In addition, as has been noted in the past (34), influenza infection seems to permanently alter the cellularity of the airways, with the present data suggesting that the infection also phenotypically changes the cells that can be isolated after recovery from the infection. The CD49a/CD29 heterodimer, VLA-1, is the only known adhesion receptor for type IV collagen (35, 36), whereas CD49b/CD29 (VLA-2) is considered the major receptor for the collagen I subtype (3, 4, 5, 37). Within the lung and many other tissues, the collagen subtypes are differentially distributed, but relatively little is understood regarding the relationship between these collagens and the localization of the T cells within the lung. To investigate these relationships, we performed an immunofluorescence analysis of collagen subtypes and T cell subsets during the course of an acute primary influenza infection. 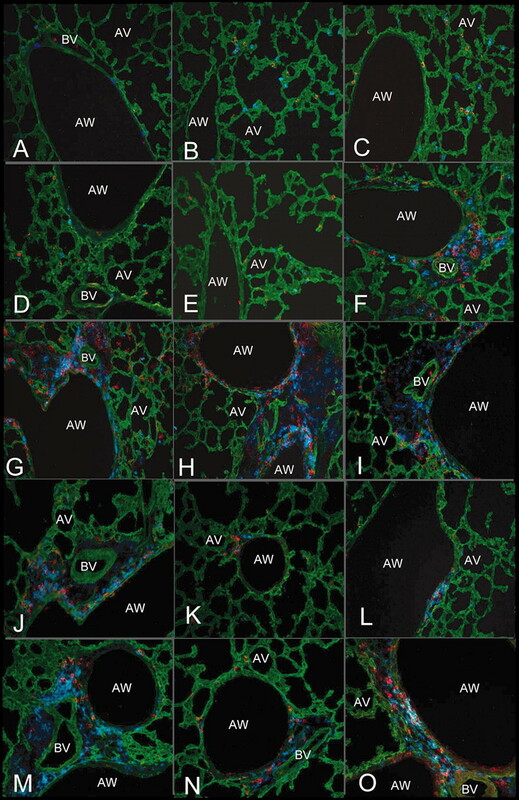 To demonstrate specificity, immunofluorescence staining was performed, separately, on frozen sections of healthy lung tissue for collagens types I, III, and IV. Single-color fluorescence images for each of the collagen subtypes is shown in Fig. 6⇓. It is easy to appreciate distinctions in each of the three collagens. The type I collagen has a fibrous appearance and is widely distributed in the parenchymal spaces within the lung tissue (Fig. 6⇓A). 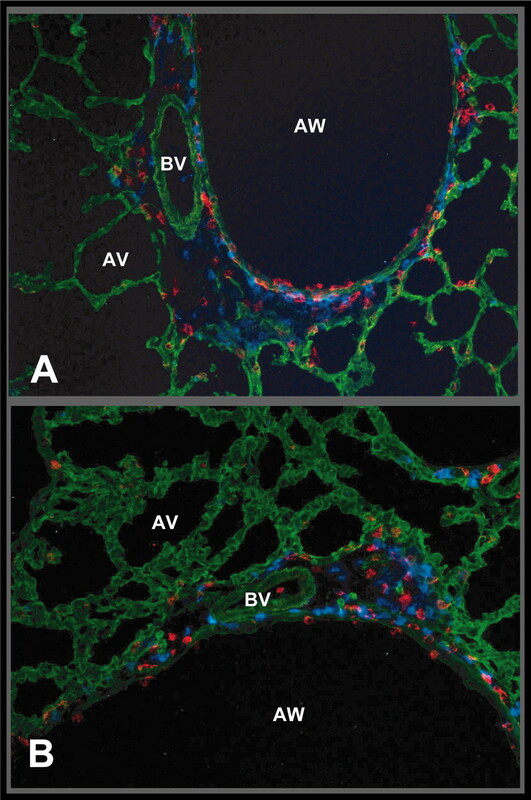 Type IV collagen is more compact in its distribution and is useful for “outlining” the boundaries of the blood vessels, airways, and alveoli (Fig. 6⇓B). Type III collagen is more sparsely distributed with a punctate distribution (Fig. 6⇓C). 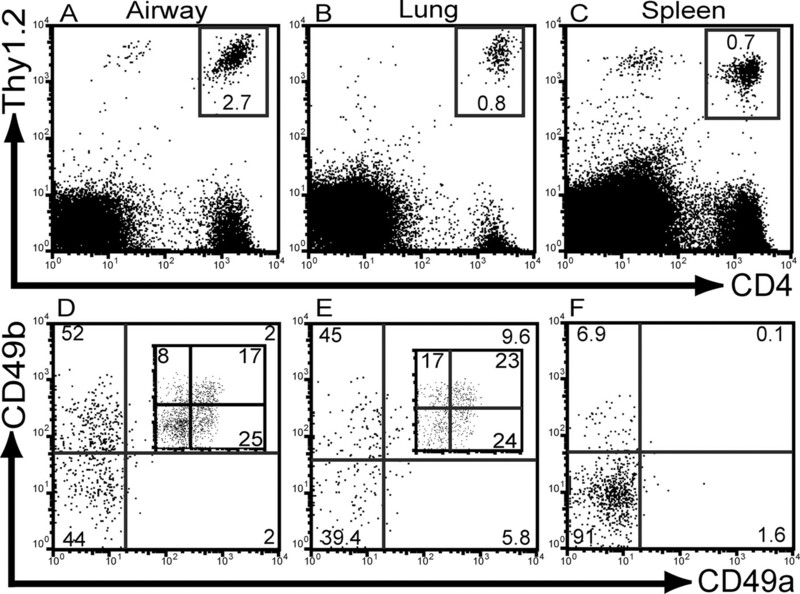 Type I, type III, and type IV collagens are differentially distributed in the lung. The lungs of healthy 8-wk-old C57BL/6 mice were carefully inflated with warmed OCT (0.8 ml) then excised and placed in OCT then frozen using a mixture of dry ice and 2-methyl butane (−45°C). Sections (5–10 μm) were cut and processed as described in Materials and Methods before staining with unlabeled goat anti-type I (A), IV (B), or III (C) collagen (Southern Biotechnology Associates; 1:200) for 60 min. Sections were then washed and stained with a secondary donkey anti-goat FITC. Imaging of the stained tissues was performed (original magnification, ×400) on a Nikon Eclipse E600 fluorescence microscope equipped with a 100 W mercury lamp (Chiu Technical) and a SPOT RT Color digital camera (Diagnostic Instruments). AW, Airway; AV, alveoli; BV, blood vessel. Having established the ability to distinguish the individual collagens, a series of lung sections were obtained on sequential days from animals infected with influenza. Animals were perfused through the heart with PBS to clear the vasculature. Lungs were then inflated in situ with OCT, excised, and frozen. The airways were not lavaged. Frozen sections were stained with anti-collagen IV FITC (green), anti-CD4-allophycocyanin (blue), and anti-CD8-PE (red) and imaged on the fluorescent microscope (Fig. 7⇓). Although a few CD4+ cells were visible on days 0–3 (Fig. 7⇓, A–D), after day 4, there was an appreciable increase in both CD4+ or CD8+ cells (Fig. 7⇓, E and F), which is corroborated by flow cytometric estimation of cell numbers (Fig. 5⇑, E and F). The major areas of infiltration were in close proximity to moderately sized blood vessels along selected airways, and there were few CD4+ and CD8+ cells filling the alveoli. Although we did not stain for virus, this pattern of infiltration is consistent with the expected distribution of the viral infection, which is restricted primarily to the large conducting airways (not the alveoli) and at early time points is not uniformly distributed. Localization of CD4- and CD8-positive lymphocytes relative to collagen type IV in the lungs of mice over the course of a primary influenza virus infection. Eight-week-old C57BL/6 female mice were inoculated with influenza A/HK/X31 by the intranasal route on day 0. On each day after infection, lungs were carefully inflated with warmed OCT (0.8 ml) then excised and placed in OCT then frozen using a mixture of dry ice and 2-methyl butane (−45°C). Sections (5–10 μm) were cut and processed as described in Materials and Methods before staining with PE-labeled rat anti-mouse CD8a (red), allophycocyanin-labeled rat-anti-mouse CD4 (blue), and unlabeled goat anti-type IV collagen (green). Sections were then washed and stained with a secondary donkey anti-goat FITC. Imaging of the stained tissues was performed on a Nikon Eclipse E600 fluorescence microscope (original magnification, ×400) equipped with a 100 W mercury lamp (Chiu Technical) and a SPOT RT Color Digital Camera (Diagnostic Instruments). A, Day 0; B, day 1; C, day 2; D, day 3; E, day 4; F, day 5; G, day 6; H, day 7; I, day 8; J, day 9; K, day 10; L, day 11; M, day 12; N, day 13; O, day 14. AW, Airway; BV, blood vessel; AV, alveoli. From days 6 to 8, a robust CD8 infiltrate was present with many CD8+ cells visible along the luminal side of the basement membrane within the airways (Figs. 7⇑, G–I, and 8⇓A). The close proximity of these CD8+ cells to the basement membrane suggests that they had localized along the basal layer of the respiratory epithelium among the epithelial cells. Also striking was that the CD4+ cells appeared to remain mostly within the parenchyma of the lung tissue with few on the luminal side of the airway epithelium, though many were in close association with the parenchymal side of the collagen IV basement membrane. Localization of CD4 and CD8 T cells in the lungs at the peak and resolution phases of the cellular response to influenza infection. As in Fig. 7⇑, CD4+, CD8+, and type IV collagen were identified by immunofluorescence. A, Day 8 lung; B, day 14 lung. AW, Airway; BV, blood vessel; AV, alveoli. To more objectively assess whether the CD4 and CD8 T cells differed in their distribution relative to collagen IV in the basement membranes, the tissue sections (Fig. 9⇓A) were subjected to computerized image analysis. We used a modified MATLAB algorithm designed to precisely locate and count individual fluorescent events in a two-dimensional matrix. The program is capable of analyzing multiple colors, so it is amenable to the three-color sections we had in hand. Because the collagen IV is not a discreet array of individual elements, a mask was applied to the green portions of the image (Fig. 9⇓B). The image analysis program stores the data as list mode files, so it can be processed using software designed for conventional multicolor flow cytometry data (Fig. 9⇓C). At day 8 after infection, 70.1 ± 3.3% of the CD8+ cells were within 0.7353 μm of collagen IV (measuring from the center of mass of a cell to the nearest edge of the collagen mask), whereas only 54.2 ± 2.4% of the CD4 were within the same proximity to collagen IV (Fig. 9⇓D). A similar analysis of deliberately mismatched lung sections (for example, collagen mask from section A, cell localization from section B) returned values of 15–17%, and were equivalent for CD4+ and CD8+ events, showing that the relationships in the matched sections were not at random. Differences in distribution of cell types is not evident in normal parenchyma due to the close approximation of basement membranes and interstitial collagen; however, in regions of interstitial edema (for example, Fig. 7⇑H), the relative paucity of CD8 cells and abundance of CD4 cells is evident, consistent with the differential localization of interstitial collagen I and basement membrane collagen IV. What remains is to formally test the relationship between the relative distribution of the CD4+ and CD8+ cells and the expression of the collagen receptors. Computerized image analysis to measure the proximity of T cells to collagen IV. Tissue sections (A) were stained as is Figs. 7⇑ and 8⇑. The precise distributions of CD4+ and CD8+ cells and collagen IV were analyzed with a modified algorithm in MATLAB image analysis software. Each of the three immunofluorescent histology component colors were analyzed separately. A mask was applied to areas that exhibited a green (collagen IV) signal (B). The position of individual CD4+ and CD8+ cells was determined by measuring the center of mass and area of each individual cell. Data were collected in list mode format and processed using FlowJo cytometry analysis software, with the center of mass values plotted in an XY two dimensional space (C). Data were queried for the proportion of CD4 and CD8 cells within 0.7353 μm of collagen IV (D). Data in D represent 4–15 individual sections per time point. Between days 9 and 10 there was a decrease of both CD4+ and CD8+ cells (Figs. 5⇑, E and F, and 7⇑, J and K). This corresponds with the clearance of virus at day 9 and is supported by flow cytometry and cell enumeration that shows a substantial contraction of the cellular response after days 8–9 of primary X31 infection (Fig. 5⇑, E and F). Interestingly, by histology it appeared that a portion of the cellular infiltration persists or continues after viral clearance and out to 14 days postinfection (Figs. 7⇑, L–O, and 8⇑B), a view supported by the flow cytometric assessment of both cell numbers (Fig. 5⇑, E and F) and phenotypes (Fig. 5⇑, A and B). This is an important phase of the response as it may be the time tissue memory becomes established. Of note is the CD49a+CD8+ population that continues to increases in proportion after day 9, and becomes the predominant memory phenotype in the airways (Fig. 5⇑A and Ref. 18). By day 14, the CD4+ and CD8+ cells remained differentially localized relative to the walls of the airways and lung tissue (Fig. 8⇑B). CD8+ cells were visible on both the luminal and parenchymal sides of the airway, whereas CD4+ cells were predominantly restricted to the parenchymal side. Image analysis of multiple sections (n = 4–8) as described above showed that on day 14, 57 ± 3.0% of the CD8+ cells and 36.4 ± 6.1% of the CD4+ cells were in close proximity (0.7353 μm) of collagen IV+ regions (Fig. 9⇑D). Again this distribution is supported by flow cytometric observations in which many CD8+ and few CD4+ cells can be isolated by bronchoalveolar lavage, whereas CD4+ cells predominate in the lung tissue. Given the observed differences in both the localization of CD4 and CD8 T cells in the lung and the differential expression of CD49a and CD49b collagen-binding integrins during the acute phase of the response, we sought to determine whether these patterns persisted into the memory phase. In the memory phase, CD49a was expressed on subpopulations of both CD4+ and CD8+ T cells in the airways (Fig. 10⇓, A and C) and lung tissue (Fig. 10⇓, B and D). In fact the majority (∼80%) of CD8+ cells in the airways, and half of the CD8 population in the lung expressed CD49a. An even higher proportion of the influenza specific subset was CD49a+ at 92 and 74% of the CD8+DbNP+ cells in the airways and lung tissue (Fig. 10⇓, G and H). However, unlike the NP-specific CD8 T cells, CD49a was not enriched among the Ag-specific CD4+ T cells primed by influenza infection (Fig. 10⇓, E and F). These observations help explain the profound effects that Ab blockade or gene deletion of CD49a has on the tissue memory CD8 T cells (18). The data would suggest similar blocking or gene deletion studies focused on the CD49a+CD4+ subset would yield more modest changes in the tissue memory CD4 T cells because both the proportion and number of these cells in the lung is lower than for CD8+ cells (24, 28). CD49a and CD49b are maintained on populations of total and Ag-specific CD4 and CD8 T cells in the airways and lungs of mice recovered from influenza infection. Airway and lung tissue were harvested 53 days after intranasal inoculation of influenza A/HK/x31 into C57BL/6 female mice (A–D, G–L, O and P) or A/WSN-OVAII with adoptive transfer of OT-II cells as described in Fig. 3⇑ (E and F, M and N). CD49a and CD49b expression was analyzed on CD4 and CD8 cells subsequent to staining with anti-CD49a (HA31/8)-Alexa 488, anti-CD49b (HA1/29)-PE, anti-CD8-TC, and anti-CD4-allophycocyanin. Ag-specific virus-primed CD4 and CD8 T cells were identified as described in Figs. 2⇑ and 3⇑. Figures depict the proportions of CD49a (A–H) or CD49b (I–P) cells after gating on live lymphocytes and CD4+, CD8+, CD4+Thy1.2+ (OT-II), or CD8+ DbNP tetramer+ cells as indicated. Values in the plots indicate the percentage of CD49a- or CD49b-positive cells within the region indicated by the bar. Looking at CD49b, whereas there were modest subpopulations of airway CD4+ cells (Fig. 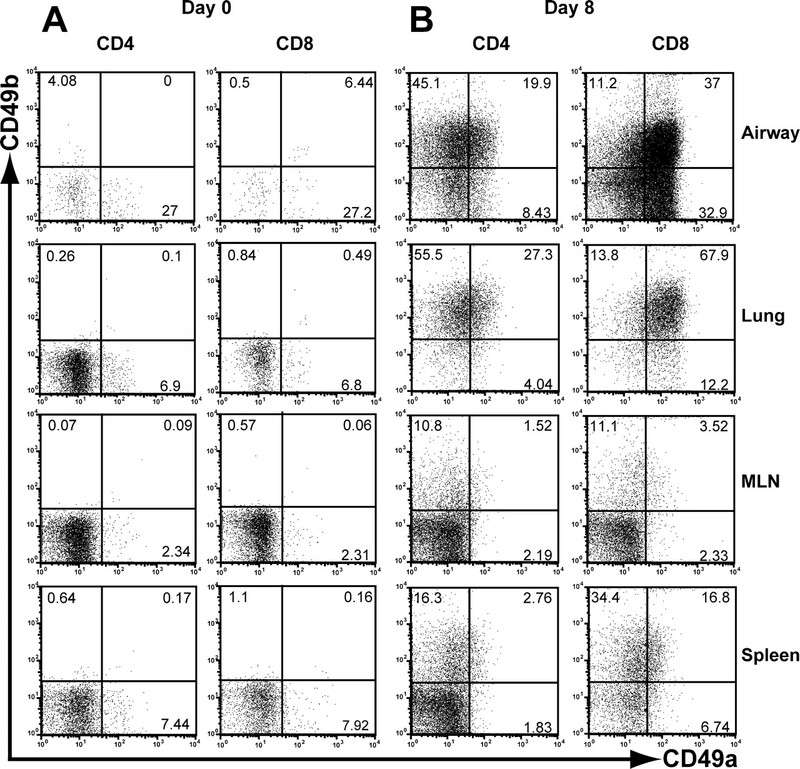 10⇑I), and lung CD4+ and CD8+ cells (Fig. 10⇑, J and L), that expressed this integrin, very few CD8+ cells in the airways were CD49b+ (Fig. 10⇑K). Analysis of the Ag-specific CD8+DbNP+ cells (Fig. 10⇑, O and P) indicated similar proportions to the bulk CD8 population. Among the few OT-II cells in the lung tissue (Fig. 10⇑, M and N), there appeared to be an increase in the proportion (50 vs 29%) of OT-II cells that expressed CD49b compared with the total CD4 subset. Compared with the acute phase (days 8–9) of flu infection, the CD49a+ proportions in the memory phase were higher for each subset, whereas the proportions of CD49b+ cells were generally a great deal lower. This is consistent with the hypothesis that VLA-1 (CD49a) is important for selection or retention of T cells in the peripheral tissues, whereas VLA-2 (CD49b) may play a different, and as yet poorly defined, role. The expression of collagen-binding integrins is a prominent feature of T cells infiltrating the lung during acute immune responses and in the memory phase. Earlier work showed that the CD49a/CD29 VLA-1 integrin heterodimer is an important regulator of CD8 memory T cells in the lung and other organs (18). The present study was undertaken to better understand the relationship of collagen-specific integrin expression on both CD4+ and CD8+ T cells and the differential distribution of collagen within the lung microenvironments. The data show that CD49a and CD49b (VLA-1 and VLA-2, respectively) are primarily expressed on both CD4+ and CD8+ T cells in the nonlymphoid tissues of the lung. CD49a (VLA-1) is expressed by a larger proportion of the CD8+ cells, particularly in the airways. This proportion increases toward the memory phase. In contrast, whereas CD49b (VLA-2) was expressed by a significant proportion of both CD4 and CD8 T cells in the lung parenchyma and airways during the acute phase, the proportions were lower among memory cells, particularly for CD8+ T cells in the airways. The general expression pattern of these integrins appears to be intrinsic to the cell type and the tissue localization, and is not affected by the mode of priming. For example, the observation that more CD4+ T cells in the lung expressed CD49b, and fewer expressed CD49a prevailed whether the cells were primed by viral infection or Th2-inducing conditions. This is at odds with the simple interpretation that CD49b expression correlates with Th1 and Th2 phenotypes among CD4 T cells (38, 39). Similar expression of CD49a and CD49b was observed on CD8+ T cells responding to lymphocytic choriomeningitis virus infection in the spleen (40). Immunofluorescence analysis of the distribution of collagen subtypes within the lung environment revealed important differences that help explain the observed localization of T cell subsets. The CD49a/CD29 integrin VLA-1 preferentially binds to type IV collagen and can also bind type I collagen and laminin. As such, it is the only known adhesion receptor for type IV collagen. Given that the lung is rich in basement membrane along the airways, it was perhaps not surprising that VLA-1+ T cells were the major population in the airways, and that immunofluorescent staining showed mostly CD8+ cells closely associated with the airway basement membranes and on the luminal side of the airway walls. This distribution also explains the effects of CD49a inhibition on the ability to retain CD8 T cells in or close to the airways in the memory phase (18). The observations suggest that one of the functions of CD49a expression may be to help localize the T cells close to the outermost layers of the lung epithelium where they could be of the most use in a re-encounter with a pathogen such as influenza. In addition to physical associations with the ECM, the localization of T cells within tissues is also regulated by chemokines (41, 42, 43). It is likely that there are important differences in the distribution of chemokines in the lung that can account for the observed predominance of CD8 T cells in the lumen of the infected airways, though the identity of these chemokines has yet to be determined. Accessibility to these chemokines could also be affected by the binding to specific collagen subtypes because it is well-established that chemotactic factors are often bound to matrix components (44, 45). Thus, collagen binding could bring the T cells into closer proximity to the chemotactic ligands. The lower proportion of CD49a+CD4 T cells in models of both virus infection and experimental allergy supports the notion that localization of CD4+ T cells in the airways may not be as beneficial to lung immunity. CD49b was a more consistent marker of CD4+ T cells in the lung. When CD49b pairs with the CD29 β1 integrin chain, it forms a heterodimeric adhesion molecule specific for type I collagen (3, 4, 5), which is rich in the lung parenchyma. Consistent with this, higher proportions of the CD4+ and CD8+ T cells isolated from the lung parenchyma expressed CD49b. Together, the observations on collagen distribution and integrin expression imply that these integrins could be directing the localization of CD4 and CD8 T cell subsets within the lung. Experiments to directly test this hypothesis remain to be performed. There are several possible explanations for the differential expression of CD49a+ and CD49b+ on T cells within the lung tissue and airways compared with the lymphoid organs. One possibility is that there are signals within the tissue and airways that increase or stabilize the expression of CD49b or CD49a, respectively. The collagen subtypes themselves could do this, and in fact although we stained for types I, III, and IV collagen there are many more collagen subtypes. These include the fibril-associated collagens with interrupted triple helices that associate as single molecules with large collagen fibrils and could modify receptor interactions (46). The role of these collagens and their distribution, for instance between lymph nodes and airways, is not well understood. An alternative possibility is that these observations reflect a selection process for T cells dependent on integrin expression. Thus, VLA-1+ cells are retained in or near the collagen IV-rich airways, whereas the abundance of type I collagen in the parenchyma may selectively retain VLA-2+ cells. It would be interesting to induce constitutive expression of VLA-1 on CD4+ T cells to see whether this affects their relative distribution in the lung tissue and airways. Previous studies showed that Ab-mediated inhibition of CD49a reduced the number of virus-specific memory CD8 T cells in the lung and other extralymphoid tissues (18), but did not affect the acute CD4 or CD8 T cell response. Similar experiments did not dramatically affect the number of virus-primed CD4+ memory T cells in the lung (data not shown), though the numbers of CD4+ memory cells in the lung are low to begin with (24, 28). The limited impact of blocking CD49a on the CD4+ cells could be explained if the substantial CD49a-negative subset was obscuring effects on the smaller CD49a+CD4 population. Interestingly, though a large proportion of T cells in the lung express CD49b, administration of blocking Abs to CD49b did not appear to affect either the CD4 or the CD8 T cell numbers in the lung or lymphoid tissues (data not shown). The latter finding is supported by the recent observation that adoptively transferred CD49a+ and CD49b−CD4 T cells homed equally well to an influenza infected lung (38). This suggests that CD49b (VLA-2) may not function in a manner analogous to CD49a (VLA-1) in regulating the retention of memory T cells in the extralymphoid space. The lack of an effect of CD49b inhibition on T cell retention is not surprising given the observed role of VLA-2 on other cell subsets. VLA-2-mediated ligation of type I collagen on neutrophils and some tumor cells is associated with increased motility (20, 47, 48). Most NK cells express CD49b/VLA-2 (49), and NK cells could be considered the prototypical extralymphoid lymphocyte. Their role in immune surveillance within tissues could be promoted by VLA-2-mediated stimulation of cell motility within the type I collagen-rich extralymphoid tissue space. VLA-2 could play a similar role on T cells, promoting their migration within extralymphoid spaces, particularly during the acute phase of the infection. An intriguing aspect of the kinetics was what appeared to be a biphasic pattern of infiltration of the CD8+ T cells. Various studies support the concept that there are multiple phases of T cell infiltration into the lung during respiratory virus infections (50). Thus, in addition to some constitutive memory T cells present at the start of an infection (though low or nonexistent in “naive” mice), there follows an early non-Ag-specific infiltrate 3–5 days after infection (51, 52) and then the entry of recently divided Ag-specific cells from the lymphoid organs around day 5 onwards (50, 51, 52, 53, 54). Our earlier observations of influenza VLA-1+ DbNP-specific CD8 T cells during primary influenza infection showed that there was a steady increase in VLA-1+ cells until day 8, the peak of the cellular response, then a slight drop at day 9, the point at which virus is cleared, followed by a steady increase again through 14 days after infection. The current phenotypic and histological data reiterate this observation for the total CD8+ T cell subset (Fig. 5⇑, A and B). After this point, the number of T cells, and of CD49a+ T cells remains increased indefinitely compared with baseline, showing that the infection can induce permanent alterations to the cellular immune components of the lung. The observations suggest that T cell infiltration is a continuous process, though at a lower rate, even after the virus is cleared, with significant implications for the formation and maintenance of the tissue memory population. It seems that the tissue memory may not be derived from T cells that were in the lung at the peak of the response, but instead comes from a separate set of cells that continue to infiltrate the tissue long after the virus is cleared. This is corroborated by a recent study using Sendai virus in which the authors showed that effector memory T cell populations in the lung airways were maintained by continual recruitment of new cells from the circulation (55). It is clear that collagen adhesion and interactions with the ECM are important for regulation of T cell populations in the lung environment, and probably within the environments of other extralymphoid tissues. The lung as a whole is quite exceptional in this regard as it is the location where the highest proportion of integrin expressing T cells exists, and these populations have significant contributions to secondary immunity to respiratory virus infections. The observations also have implications for the regulation of allergic responses because the trafficking and retention of allergen-specific T cells in the lung could be viewed to have detrimental effects upon Ag re-encounter. Recent work suggests that CD49b is stably expressed on a subset of CD4+ memory T cells, suggesting that these are a population of memory T cells completely distinct from the CD49b negative subset (38). It is not known to what extent collagen integrin-negative memory T cells can convert to collagen integrin-positive cells during the resting memory phase. Determining the signals that regulate the expression of these adhesion molecules on T cells remains as an important area for discovery. It also remains to be determined whether these integrins function simply by affecting adhesion and retention, stimulating or retarding motility, by promoting the survival of T cells in the extralymphoid spaces, or some combination of these functions. ↵1 This work was supported in part by grants from the American Lung Association (RG-075N) and the National Institutes of Health (AG021970 and ESO1247). This work was also supported by National Institutes of Health Training Grants HL66988 (to S.J.R. ), AI07169 (to T.J.C. ), and HL6688 (to S.J.A.). ↵2 M.R., S.J.R., and T.J.C. contributed equally to this study. ↵4 Abbreviations used in this paper: ECM, extracellular matrix; s.e., structuring element; MLN, mediastinal lymph node; PA, polymerase; NP, nucleoprotein. Blankenship, J. W., B. C. McKinney, P. J. Roos, L. B. Sandberg. 1993. Quantitation of lung elastin and collagen in protein and essential fatty acid malnourished rats. Connect. Tissue Res. 29: 311-318.
van Kuppevelt, T. H., J. H. Veerkamp, J. A. Timmermans. 1995. Immunoquantification of type I, III, IV and V collagen in small samples of human lung parenchyma. Int. J. Biochem. Cell Biol. 27: 775-782. Vandenberg, P., A. Kern, A. Ries, L. Luckenbill-Edds, K. Mann, K. Kuhn. 1991. Characterization of a type IV collagen major cell binding site with affinity to the α1β1 and the α2β1 integrins. J. Cell Biol. 113: 1475-1483. Gullberg, D., K. R. Gehlsen, D. C. Turner, K. Ahlen, L. S. Zijenah, M. J. Barnes, K. Rubin. 1992. Analysis of α1β1, α2β1 and α3β1 integrins in cell–collagen interactions: identification of conformation dependent α1β1 binding sites in collagen type I. EMBO J. 11: 3865-3873. Kern, A., J. Eble, R. Golbik, K. Kuhn. 1993. Interaction of type IV collagen with the isolated integrins α1β1 and α2β1. Eur. J. Biochem. 215: 151-159. Rawn, J. D.. 1989. Biochemistry Neil Patterson Publishers, Burlington. Gardner, H.. 2003. Integrin α1β1. D. Gullberg, ed. I Domains in Integrins 14 Landes Bioscience, Georgetown. Munoz, F. M., G. J. Galasso, J. M. Gwaltney, Jr, F. G. Hayden, B. Murphy, R. Webster, P. Wright, R. B. Couch. 2000. Current research on influenza and other respiratory viruses. II International Symposium. Antiviral Res. 46: 91-124. Laver, W. G., N. Bischofberger, R. G. Webster. 2000. The origin and control of pandemic influenza. Perspect. Biol. Med. 43: 173-192. Webster, R. G.. 1998. Influenza: an emerging disease. Emerg. Infect. Dis. 4: 436-441. Kendal, A. P.. 1987. Epidemiologic implications of changes in the influenza virus genome. Am. J. Med. 82: 4-14. Both, G. W., M. J. Sleigh, N. J. Cox, A. P. Kendal. 1983. Antigenic drift in influenza virus H3 hemagglutinin from 1968 to 1980: multiple evolutionary pathways and sequential amino acid changes at key antigenic sites. J. Virol. 48: 52-60. Verhoeyen, M., R. Fang, W. M. Jou, R. Devos, D. Huylebroeck, E. Saman, W. Fiers. 1980. Antigenic drift between the haemagglutinin of the Hong Kong influenza strains A/Aichi/2/68 and A/Victoria/3/75. Nature 286: 771-776. Liang, S., K. Mozdzanowska, G. Palladino, W. Gerhard. 1994. Heterosubtypic immunity to influenza type A virus in mice: effector mechanisms and their longevity. J. Immunol. 152: 1653-1661. McMichael, A. J., F. M. Gotch, G. R. Noble, P. A. Beare. 1983. Cytotoxic T-cell immunity to influenza. N. Engl. J. Med. 309: 13-17. Hogan, R. J., W. Zhong, E. J. Usherwood, T. Cookenham, A. D. Roberts, D. L. Woodland. 2001. Protection from respiratory virus infections can be mediated by antigen- specific CD4+ T cells that persist in the lungs. J. Exp. Med. 193: 981-986. Ray, S. J., S. N. Franki, R. H. Pierce, S. Dimitrova, V. Koteliansky, A. G. Sprague, P. C. Doherty, A. R. de Fougerolles, D. J. Topham. 2004. The collagen binding α1β1 integrin VLA-1 regulates CD8 T cell-mediated immune protection against heterologous influenza infection. Immunity 20: 167-179. Werr, J., J. Johansson, E. E. Eriksson, P. Hedqvist, E. Ruoslahti, L. Lindbom. 2000. Integrin α2β1 (VLA-2) is a principal receptor used by neutrophils for locomotion in extravascular tissue. Blood 95: 1804-1809. Werr, J., X. Xie, P. Hedqvist, E. Ruoslahti, L. Lindbom. 1998. β1 Integrins are critically involved in neutrophil locomotion in extravascular tissue In vivo. J. Exp. Med. 187: 2091-2096. Friedl, P., F. Entschladen, C. Conrad, B. Niggemann, K. S. Zanker. 1998. CD4+ T lymphocytes migrating in three-dimensional collagen lattices lack focal adhesions and utilize β1 integrin-independent strategies for polarization, interaction with collagen fibers and locomotion. Eur. J. Immunol. 28: 2331-2343. Allan, W., Z. Tabi, A. Cleary, P. C. Doherty. 1990. Cellular events in the lymph node and lung of mice with influenza: consequences of depleting CD4+ T cells. J. Immunol. 144: 3980-3986. Chapman, T. J., M. R. Castrucci, R. C. Padrick, L. M. Bradley, D. J. Topham. 2005. Antigen-specific and non-specific CD4+ T cell recruitment and proliferation during influenza infection. Virology 340: 296-306. Mendrick, D. L., D. M. Kelly, S. S. duMont, D. J. Sandstrom. 1995. Glomerular epithelial and mesangial cells differentially modulate the binding specificities of VLA-1 and VLA-2. Lab. Invest. 72: 367-375. Flynn, K. J., G. T. Belz, J. D. Altman, R. Ahmed, D. L. Woodland, P. C. Doherty. 1998. Virus-specific CD8+ T cells in primary and secondary influenza pneumonia. Immunity 8: 683-691. Topham, D. J., T. J. Chapman, M. Richter. 2006. Lymphoid and extralymphoid CD4 T cells that orchestrate the anti-viral immune response. Exp. Rev. Clin. Immunol. 2: 267-276. Swain, S. L., D. T. McKenzie, R. W. Dutton, S. L. Tonkonogy, M. English. 1988. The role of IL4 and IL5: characterization of a distinct helper T cell subset that makes IL4 and IL5 (Th2) and requires priming before induction of lymphokine secretion. Immunol. Rev. 102: 77-105. Mosmann, T. R.. 1991. Regulation of immune responses by T cells with different cytokine secretion phenotypes: role of a new cytokine, cytokine synthesis inhibitory factor (IL10). Int. Arch. Allergy Appl. Immunol. 94: 110-115. Eum, S. Y., S. Haile, J. Lefort, M. Huerre, B. B. Vargaftig. 1995. Eosinophil recruitment into the respiratory epithelium following antigenic challenge in hyper-IgE mice is accompanied by interleukin 5-dependent bronchial hyperresponsiveness. Proc. Natl. Acad. Sci. USA 92: 12290-12294. Topham, D. J., R. A. Tripp, P. C. Doherty. 1997. CD8+ T cells clear influenza virus by perforin or Fas-dependent processes. J. Immunol. 159: 5197-5200. Topham, D. J., P. C. Doherty. 1998. Clearance of an influenza A virus by CD4+ T cells is inefficient in the absence of B cells. J. Virol. 72: 882-885. Doherty, P. C., A. M. Hamilton-Easton, D. J. Topham, J. Riberdy, J. W. Brooks, R. D. Cardin. 1997. Consequences of viral infections for lymphocyte compartmentalization and homeostasis. Semin. Immunol. 9: 365-373. Miner, J. H., J. R. Sanes. 1994. Collagen IV α3, α4, and α5 chains in rodent basal laminae: sequence, distribution, association with laminins, and developmental switches. J. Cell Biol. 127: 879-891. Dustin, M. L., A. R. de Fougerolles. 2001. Reprograming T cells: the role of extracellular matrix in coordination of T cell activation and migration. Curr. Opin. Immunol. 13: 286-290. Hemler, M. E.. 1990. VLA proteins in the integrin family: structures, functions, and their role on leukocytes. Annu. Rev. Immunol. 8: 365-400. Kassiotis, G., D. Gray, Z. Kiafard, J. Zwirner, B. Stockinger. 2006. Functional specialization of memory Th cells revealed by expression of integrin CD49b. J. Immunol. 177: 968-975. Sasaki, K., T. Tsuji, T. Jinushi, J. Matsuzaki, T. Sato, K. Chamoto, Y. Togashi, T. Koda, T. Nishimura. 2003. Differential regulation of VLA-2 expression on Th1 and Th2 cells: a novel marker for the classification of Th subsets. Int. Immunol. 15: 701-710. Andreasen, S. O., A. R. Thomsen, V. E. Koteliansky, T. I. Novobrantseva, A. G. Sprague, A. R. de Fougerolles, J. P. Christensen. 2003. Expression and functional importance of collagen-binding integrins, α1β1 and α2β1, on virus-activated T cells. J. Immunol. 171: 2804-2811. Miyasaka, M., T. Tanaka. 2004. Lymphocyte trafficking across high endothelial venules: dogmas and enigmas. Nat. Rev. Immunol. 4: 360-370. Pelletier, A. J., L. J. van der Laan, P. Hildbrand, M. A. Siani, D. A. Thompson, P. E. Dawson, B. E. Torbett, D. R. Salomon. 2000. Presentation of chemokine SDF-1α by fibronectin mediates directed migration of T cells. Blood 96: 2682-2690. Lortat-Jacob, H., A. Grosdidier, A. Imberty. 2002. Structural diversity of heparan sulfate binding domains in chemokines. Proc. Natl. Acad. Sci. USA 99: 1229-1234. Gelse, K., E. Poschl, T. Aigner. 2003. Collagens: structure, function, and biosynthesis. Adv. Drug Deliv. Rev. 55: 1531-1546. Yang, C., M. Zeisberg, J. C. Lively, P. Nyberg, N. Afdhal, R. Kalluri. 2003. Integrin α1β1 and α2β1 are the key regulators of hepatocarcinoma cell invasion across the fibrotic matrix microenvironment. Cancer Res. 63: 8312-8317. Hangan, D., S. Uniyal, V. L. Morris, I. C. MacDonald, C. von Ballestrem, T. Chau, E. E. Schmidt, A. F. Chambers, A. C. Groom, B. M. Chan. 1996. Integrin VLA-2 (α2β1) function in postextravasation movement of human rhabdomyosarcoma RD cells in the liver. Cancer Res. 56: 3142-3149. Arase, H., T. Saito, J. H. Phillips, L. L. Lanier. 2001. Cutting edge: the mouse NK cell-associated antigen recognized by DX5 monoclonal antibody is CD49b (α2 integrin, very late antigen-2). J. Immunol. 167: 1141-1144. Woodland, D. L., I. Scott. 2005. T cell memory in the lung airways. Proc. Am. Thorac. Soc. 2: 126-131. Topham, D. J., M. R. Castrucci, F. S. Wingo, G. T. Belz, P. C. Doherty. 2001. The role of antigen in the localization of naive, acutely activated, and memory CD8+ T cells to the lung during influenza pneumonia. J. Immunol. 167: 6983-6990. Ely, K. H., L. S. Cauley, A. D. Roberts, J. W. Brennan, T. Cookenham, D. L. Woodland. 2003. Nonspecific recruitment of memory CD8+ T cells to the lung airways during respiratory virus infections. J. Immunol. 170: 1423-1429. Flynn, K. J., J. M. Riberdy, J. P. Christensen, J. D. Altman, P. C. Doherty. 1999. In vivo proliferation of naive and memory influenza-specific CD8+ T cells. Proc. Natl. Acad. Sci. USA 96: 8597-8602. Hogan, R. J., L. S. Cauley, K. H. Ely, T. Cookenham, A. D. Roberts, J. W. Brennan, S. Monard, D. L. Woodland. 2002. Long-term maintenance of virus-specific effector memory CD8+ T cells in the lung airways depends on proliferation. J. Immunol. 169: 4976-4981.